B&K Precision recently announced two new digital storage oscilloscopes (DSO) and completely refreshed its DSO portfolio. These new oscilloscopes, models 2540B and 2542B, offer bandwidths of 60 MHz and 100 MHz respectively with 1 GSa/s sampling rates. Both models are equipped with significant upgrades over their predecessors and provide technical schools and service repair shops an even more cost-effective solution. Two notable upgrades include deep memory up to 2.4 Mpts and a built-in LAN interface. The deep memory feature lets users capture more waveform data while maintaining high sample rates over a longer period of time–useful for various applications requiring high waveform resolution for single-shot waveform captures. The addition of the standard LAN interface to the DSO’s RS232 and USB ports provides users another method of remote PC connectivity through Comsoft PC software or SCPI commands, as well as the ability to capture screenshots via a web browser. "The LAN interface can be a valuable tool in an educational setting by allowing instructors and students to easily view the oscilloscope’s display via web browser," said Jorg Hesser, VP of Sales & Marketing at B&K Precision. 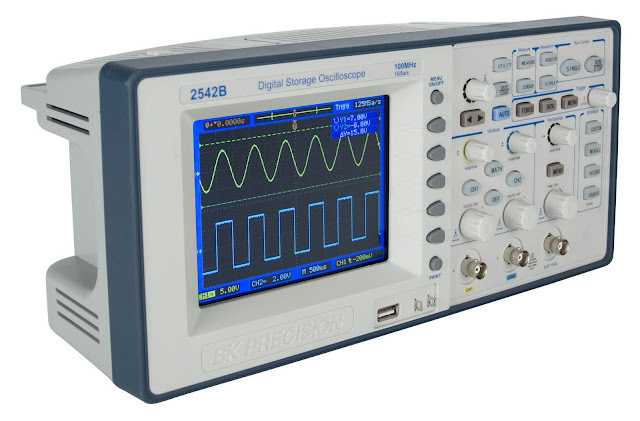 "This feature combined with deep memory is not typically found in oscilloscopes at this price range." Continuing the trend of B&K Precision's recent scope developments, the 2540B and 2542B both improve over previous models with a lightweight and more portable form factor. Both models feature a bright 5.7" color display and offer powerful tools such as pulse width, video and slope triggering, digital filtering, waveform recorder, pass/fail testing, and automatic measurements to help debug circuits. These DSOs also provide FFT and math functions to add, subtract, and multiply input channels. Novice and experienced users alike will benefit from the included context-sensitive help feature, multi-language interface, shortcut keys to access frequently used functions, and the ability to disable the Auto Set button for training. A USB host port is provided on the front panel to quickly save setup and waveform data, screenshots, or CSV files to a USB flash drive. Available immediately, B&K Precision's 2540B (60 MHz bandwidth) and 2542B (100 MHz bandwidth) DSOs list at $779 and $899 respectively.